Egglo is an interactive egg hunt with a Gospel message. TRUE EASTER MEANING: When did Easter become about presents, candy and a rabbit? 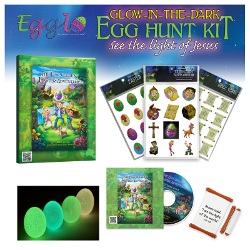 Egglo is a glow in the dark Easter egg game with a Christian message. The glowing eggs represent Jesus - God's light of the world (GLOW). It's a powerful lesson your kids will remember. SUNDAY SCHOOL / CHURCH PROGRAM: A perfect Sunday school curriculum. Egglo makes it easy by including a how-to guide with printable invitations, cut-outs, decorations, coloring pages, and more. INTERACTIVE STORYBOOK: In The Egg-cellent Easter Adventure kids search for glowing eggs, just like your kids will do. The eggs lead the kids on a fun adventure, learning biblical lessons, and hunting for the greatest treasure of all - Jesus! Kids learn about Jesus in a fun, memorable way. KEEPSAKE REMINDERS: Egglo Eggs are hands-on fun that lasts. SAVE TIME AND MONEY: High quality Easter eggs that are reusable, refillable and rechargeable with light. JUST IN TIME FOR EASTER: Leave on a doorstep with a note, or even mail one! Great for Sunday school lessons and crafts. Fun lunchbox surprises. Cool party favors or prizes. Light up scavenger hunts or birthday games. The EGGLO KIT contains everything you need to start your adventure. BONUS: Glow in the dark event program curriculum. A step by step guide to plan an event, including printable invitations, coloring pages, cut outs and more. Don't forget to add more Glow in the Dark Easter Eggs to your order! View the entire line of Egglo Products available on Kidology!